This is the second Fan block for the Victorian Symbolism Challenge because the first block only included fan charms. 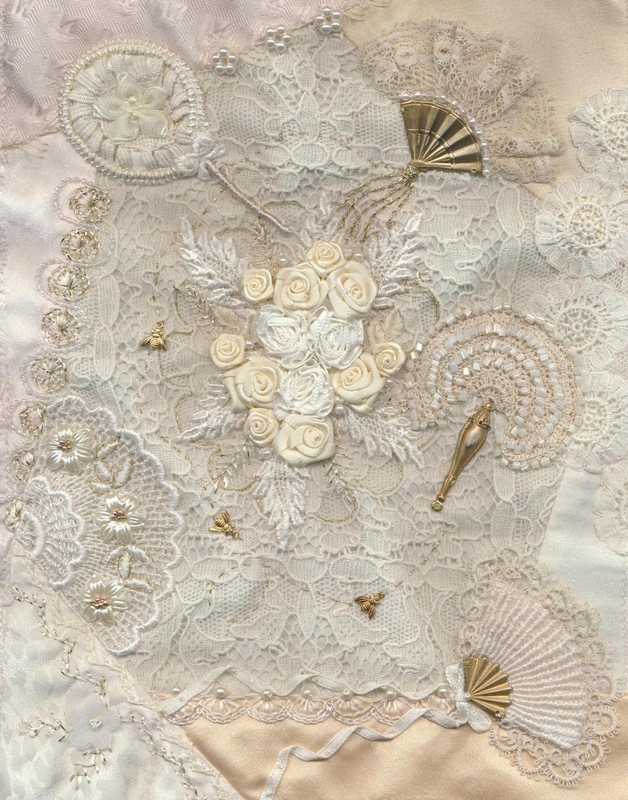 I set myself a challenge to see how many types of fans I could include on one block and came up with these five plus a bouquet of roses in the centre.......suitable for any Victorian bride as she flutters her fan. I used silk thread for the needle woven fan with a very fine tatted edging (I can't take credit for the edging or I would still be tatting away and not blogging VBG), It was part of a length of vintage tatting which I'd unpicked off an old garment just in case I would want to use it some day, while the others include antique lace and the beaded crocheted fan utilises beads unpicked from a purse bought at a thrift shop. OHHHHH this is soooooo beautiful and definitely does justice to Victorian fans!!! I LOVE it! What a wonderful victorian fan block. Debbie S.
love this block the fans are so cute. This is going to be a beautiful quilt when its finished. Thankyou for the comments. My DH wondered if this quilt is actually for our bed (of course it is!) because he says "It's going to weigh a ton when it's finished!!" Fantastic fans Viv. Just love your creations.